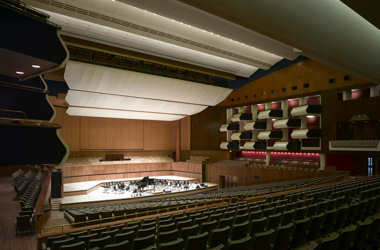 The refurbished and re-opened Royal Festival Hall doesn't look that different inside the auditorium, but its sound is transformed beyond expectations and its seating now accommodates long thighs. Russell Johnson of ARTEC, responsible for the sound design of Lucerne's KKL and many of the world's greatest modern concert halls, told me six years ago that he had learnt from "unsatisfactory experience, reluctantly undertaken, aimed to improve the acoustics in existing halls - - he has declined pressing invitations to do so in several cities including London. Having in such assignments achieved small, possible improvements within the constraints of the situations, he found himself criticised later for not having done magically better than ever could have been possible". Well, science and acoustic art seem to have moved on and Larry Kirkegaard has miraculously improved the acoustics to an unimaginable degree, evident from the first bars of Knussen's violin concerto of 2000, well received in its early performances. Everything was sharp and clear, Tetslaff's violin sounding warmer than often in the past, every touch of orchestration vividly distinct. The work itself disappointed; pleasant, deftly orchestrated neo-romantic music (Knussen’s Walton-esque Violin Concerto - AC in the FT) which had nothing to offend anyone, but was rather forgettable. After its 17 minutes we retired to the bars for the interval! The expanded bar areas being uncrowded, perhaps RFH might run to some more chairs for elderly concertogers? A hot evening in globally warmed London, we were not alone in wishing that jugs of cold water might be put on the counter, as in most London venues, rather than having to be ordered from the barman. Mahler prescribed a substantial break in at least one of his symphonies. Would it have been sacrilegious to have moved the concert interval to after the long first movement of No. 3? Some of us find sitting still for about an hour and three quarters quite a strain. I felt for the choirs, especially the children who had to sit patiently for so long before their Bim Bam moment of glory; Michelle DeYoung, tall and resplendent, came on stage only after an hour or so to sing her O Mensch! Gib Acht! to fine effect. Is Mahler's slow finale, rising to ff climaxes one after another, sublime or banal? Reading reviews in the papers of the previous night's Gala concert, we regretted that we had not been invited to cover it (q.v: the auditorium packed with glitterati - not quite as many as had been hoped - The Independent). That programme, with Birtwistle, Ives, Ligeti and Julian Anderson, was far closer to the core interests of Musical Pointers, and reviews seen have reminded us of the divide between print and electronic reviewing, still sometimes extant, rehearsed plus correspondence in our article Only a Website, which had been prompted by tonight's Esa-Pekka Salonen.